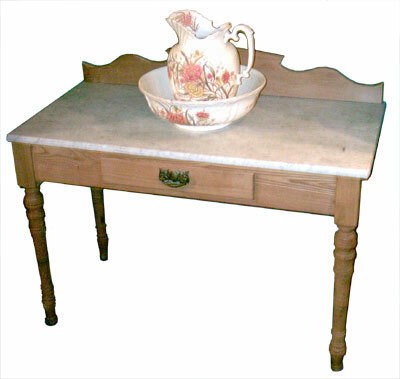 We always have in stock a selection of tables ... dining tables, occasional tables, hall tables, washstands, etc. The inlaid demi lune table in the foreground opens to a circular games table. The piano stool is Victorian, revolving and has nice turned legs. 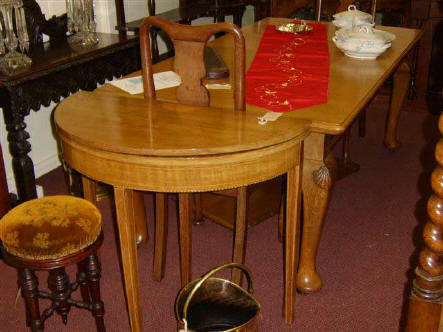 At the rear is an attractive light oak dining table which would seat 10 people when 2 leaves are inserted. 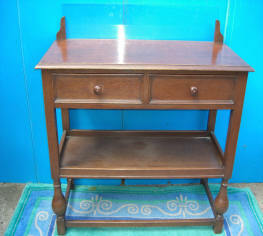 and would make a lovely hall table or decorative table for a large traditional bathroom. 2 spare leafs, attractive ball and claw feet, with castors. We have Chippendale style chairs to match. We also have the matching sideboard. At Pitmedden Furniture Workshop our stock of tables includes large dining tables down to small coffee tables and is constantly changing and it is not possible to show all available items. 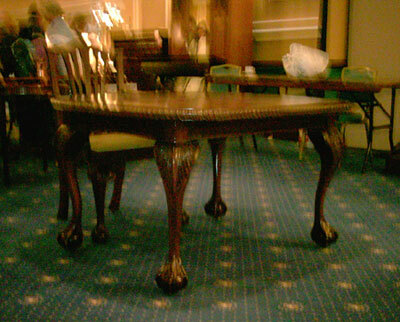 The photographs are examples of tables which we have in stock or which we have recently sold.